Are you ready to make your resolutions a reality? Every year, the top New Year's resolutions are health related: exercise more, weight loss, tone up, etc. Too often, many of those resolutions are abandoned by the end of January. 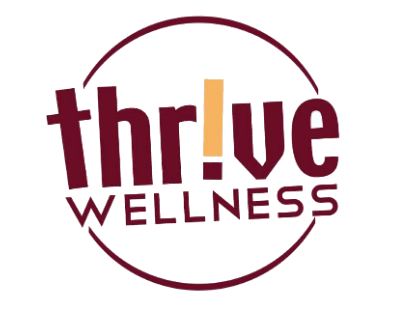 At Thrive Wellness, we are committed to helping you meet your health and fitness goals for a lifetime! When you join Thrive Wellness in January, you'll receive a 50% discount off the initiation fee (normally $50/individual) and there are no term membership contracts. Memberships are all on a month-to-month basis ($49/mo) because we want to earn your business every month. The way to meet your goals is to establish good habits and exercise consistently. As added incentive when you join in January, come in at least twice a week for the first eight weeks and we'll pay your next month's dues! Thrive Wellness is staffed by personal trainers who are committed to you! We specialize in giving personalized service for both men and women of all ages. You'll be trained on a new workout program each month--or you can do your own thing--either way you'll be supervised by our trainers. We offer a variety of fitness classes as well as the Fitness on Demand system of pre-recorded classes in our upstairs studio, which you can use anytime the room is available. Other options are the guaranteed Thrive weight management plan, one-on-one or small group personal training, massages, facials and Synergie cellulite reduction treatments. All services are open to Thrive members and guests alike. You won't find another fitness center in Grants Pass that offers workout programs designed and supervised by certified personal trainers all included in the no-contract membership! Remember, when you join in January, you'll save 50% the initiation fee and earn a FREE month dues. Call or stop by to get started in making those resolutions are reality! What do you have to lose?